It's the middle of November and what with the harsh cold winds and central heating chances are it will be affecting your face. I know this change of season has changed mine! Swapped my summer moisturiser for a thicker one for winter, still isn't quite cutting it at the moment. "For a flaming good clean, ablaze with freshly crushed Dragon Fruit from the depths of Central America and pulped Kiwi Fruit, this warming wonder reaches into pores removing trapped oil and dirt…a fiery feast for smooth, clean skin"
What is particularly appealing to me about this face mask is the self heating element. Having a face mask to warm up my cold nose while getting to work on my pores, bonus. 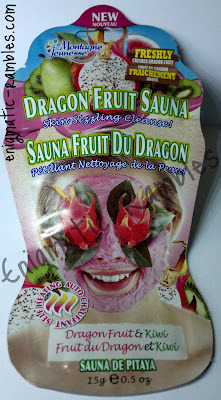 Have you ever had a dragon fruit? I got one once, cut it open but didn't dare to eat it! I suppose I didn't know if you eat raw or have to do something to it first. The product itself is quite thick, no chance of it running off your face. Has a nice smell, although I couldn't quite put my finger on what it actually was, familiar though. Very pink, as you can see my forehead smothered in it. There are little black bits, which I imagine are kiwi fruit seeds. After using this face mask my skin felt really deep cleaned, I didn't find this too smoothing but then again this wasn't a scrubby one. My pores felt cleaner and with the heat factor it really made for a nice relaxing pamper experience. As with all Montagne Jeunesse masks they are bunny (and all animal) friendly and suitable for vegetarians, and made with all natural ingredients. Available from Asda, Boots and of course Montagne Jeunesse.